Cross country running is not often known as a contact sport. Then again, not many people are familiar with racing during the deer rut. Gwyneed Mercy University senior Justin DeLuzio was competing in an 8K race on Nov 12 when two deer ran when a deer knocked him straight off his feet. 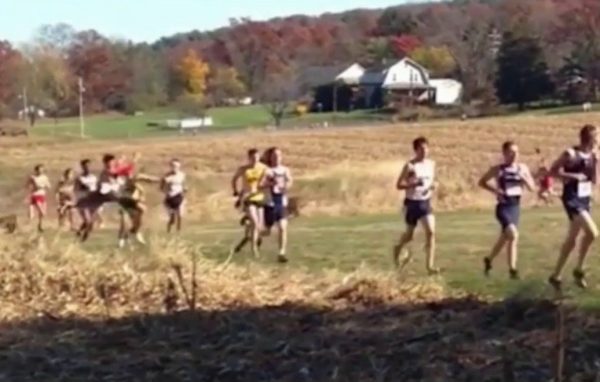 Two deer ran across the course in Center Valley, Pennsylvania at just after the one-mile mark. On slow motion you get a sense of the full brunt of the impact as this deer leveled a solid body shot to the gut, sending the young man flying. DeLuzio was badly bruised but still managed to finish the race. Teammate Matt French stopped to help Justin to his feet and stayed with him for the remainder of the race, according to a statement on the team’s website. next articleIs Your State More Prone to Deer Collisions?